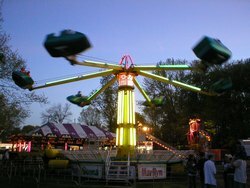 The Fireball is the first ride you’ll notice upon entering the fair; it’s hard to miss a giant blue ring covered in lights. This Larson made Fireball was in good condition and ran pretty long, the ride op even stopped the train upsidedown a couple of times. 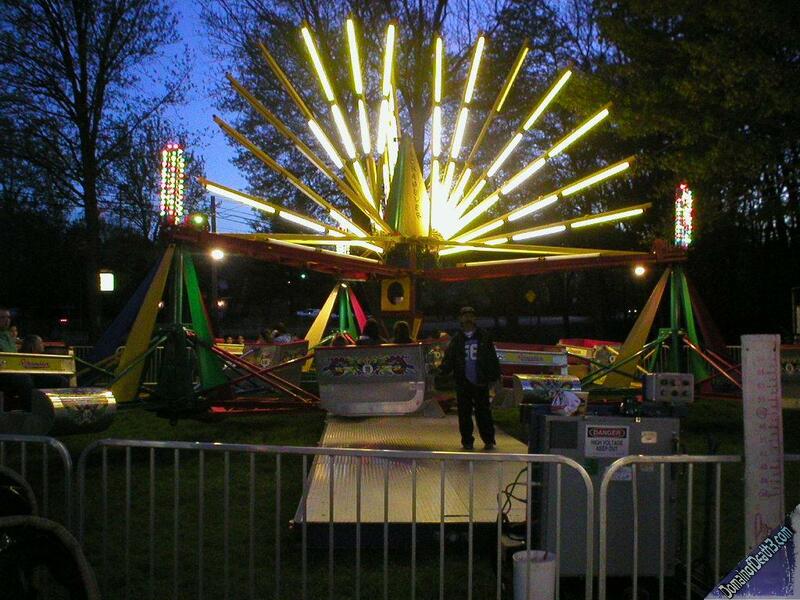 This is the first times I’ve seen any type of Ring of Fire ride at a small carnival. 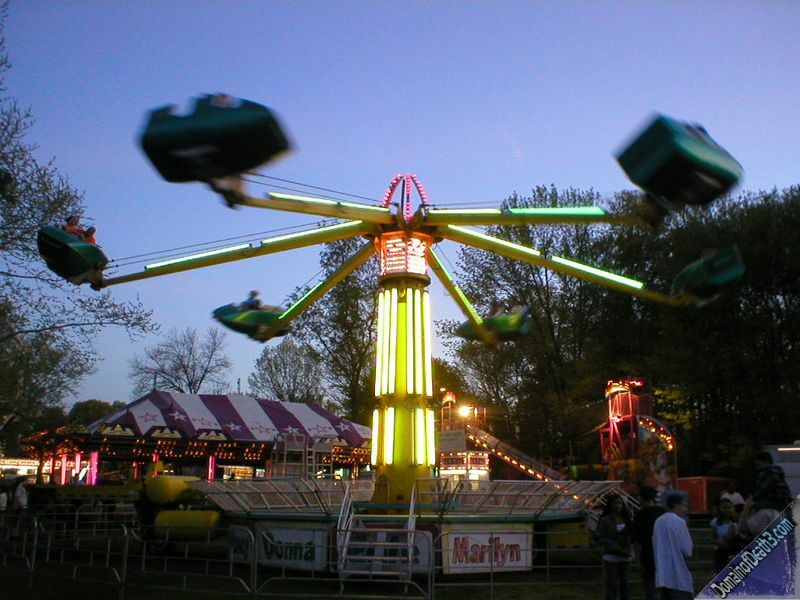 Usually the larger fairs such as the Meadowlands or State Fair have these rides. Immediately next to the Fireball was the Dartron Hurricane, and old one at that. The surprising thing is that this is undeniably the same Hurricane that I have a photo of dating back to 1996! This Hurricane uses flip down lapbars and is decked out with long light tubes along it’s sweeps and central tower. What tipped me off to its status of being the same ride from 96 is the awful green and yellow color scheme. 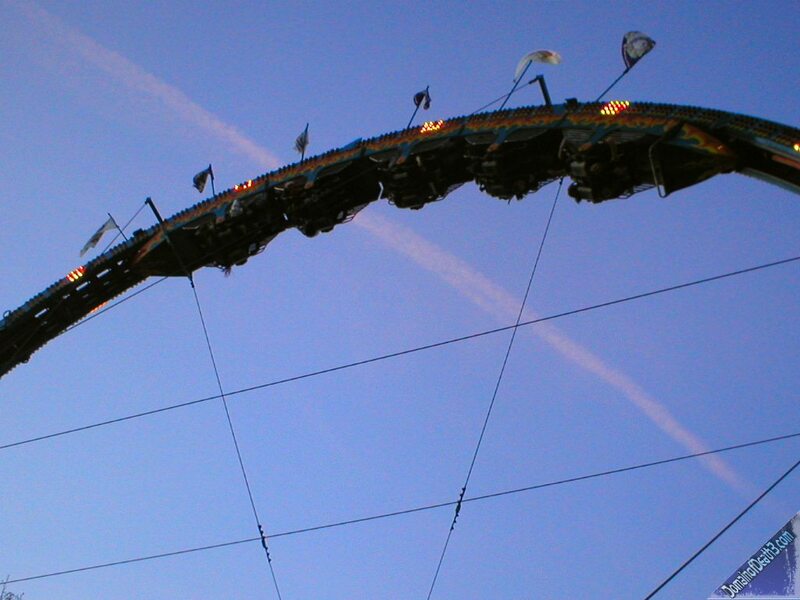 In the same area was the Pharaoh’s Fury, a Chance made swinging ship ride. I always wondered as to why they slapped an Egyptian theme on a swinging ship but whatever. This one had some rust on the supports and didn’t seem like it was in the greatest of condition. It also had absolutely no security gates on the far side of the ride so if you were daring enough you could stand right under the ship as it swung over you. I’m not about to try that however! On the far side of the midway was a Scrambler and this Scrambler was in fact a Big Eli. It had all kinds of banners and an elaborate light package but still looked kind of crappy. Those yellow light tubes just don’t do it for me! I like the other centerpieces better with the lights coming out of the center. Anyway, this ride loaded soooo slowly. The Newport smoking ride op was determined to fill up every damn seat on the ride. Of course he was less caring about safety as a couple of the pins that act as a second lock on the safety bar were left dangling about. I remember when I worked as a ride op at an amusement park; I made sure every pin on the Scrambler was in before running the ride at full tilt; I was so paranoid about the unlikely event of the door flying open on my watch. He also left the entrance door open while boarding which is great if you want to go nuts during the loading process. After the long loading, the ride op ran it for about two minutes. To the right of the Scrambler was an old Roundup with one of those retro “it defies gravity!” signs in front of it. When this Roundup started rising up, the platform was rotating pretty slowly. 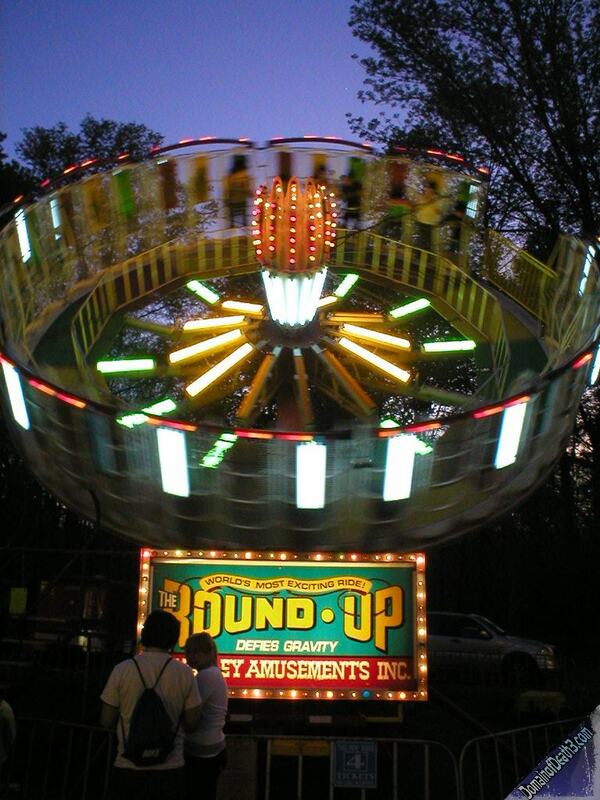 I was like “another broken Roundup…” Then it seemed to speed up as the arm rose into its highest position. Along with major rides, this fair had a ton of kiddie rides set in another section along with an alley of skill games and chance wheels. I didn’t take a spin on any of the rides but I should have checked the ticket prices, which I’m sure were insane.